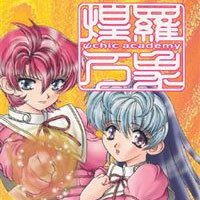 Plot Summary: The Psychic Academy is a school for students who have "aura ability." These people can use certain elements (i.e. fire, water, earth) depending on their aura. Shiomi Ai is a new student, unsure of his ability, which has yet to reveal itself. He hopes to reunite with his childhood friend/crush Orina but once there, he meets Mew, a powerful aura user who doesn't like to talk. "Psychic Academy" follows Shiomi's relationships between Orina and Mew while he tries to figure out his place in the aura world.